Dance in its widest sense is the personalised human reaction to the appeal of a general rhythm which marks not only human life but the universe. It is this rhythm, which we call laya, that influences all the physical and spiritual manifestations of life. Dancing is also an arrangement or pattern in space, as architecture and painting and sculpture are and employs spatial rhythm. And like music, it is an arrangement in time employing rhythm. Thus dance is the only art which can be called time - space art, employing rhythm in both the spheres – audible and visual. Dance is a medium of communication (a language), it is used effectively to convey some meaning, emotion and cultural values. Dance is specialized area of performing arts, demanding a high level of physical preparation and thorough understanding of aesthetics (principles) and their global contexts. In a nut shell dance is an artistic form of non verbal communication. 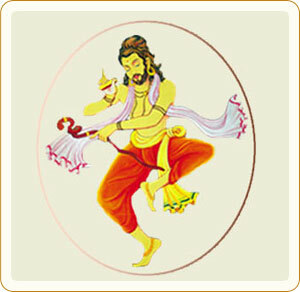 The dancer’s nritya and songs accompanied by abhinaya should depict bhavavas and conform to the proper tala. The dancer should sing with her mouth, express the meaning by the hastas,show the bhaavas by the eyes and move according to the taala with the feet. Yato Manastato Bhaavo Yato Bhaavastato Rasaha"
Whither the mood goes, there is rasa born." The Natya Shastra was created in the beginning of Treta Yug by Brahma on the request of Indra and other Devas as an object of diversion. As the lower castes (Shudras) were not entitled to listen to the four Vedas (Sama, Yajur, Rig and Atharav), Brahma created the Natya Shastra as the fifth Veda which was open to all, irrespective of caste and creed. Prior to the creation of the Natya Veda, Brahma entered a yogic trance in which he recalled the four Vedas. He drew the recitative (Paathya) from the Rig, songs (Geeta) from the Sama, histrionic representation (Abhinaya) from the Yajur and sentiments (Rasa) from the Atharav. These aspects are the four main constituents of the Natya Veda. When the Natya Veda was ready, the Gods expressed their inability to practice it, and Brahma passed it to Bharata Muni and his one hundred sons who were asked to practice it. The dance was first seen at the Flag Festival of Indra to celebrate the victory of the Devas against the Daanavas. Kuchipudi is the classical dance form of the south Indian state of Andhra Pradesh. This style which had its origins in the Bhagavata Mela Natakam or dance drama tradition has come to be known as the kuchipudi dance style today. The dance style gets its name from the village called kuchipudi, where this dance drama tradition was nurtured in all its sanctity for many decades, dating back to the 13 century. It was in the 14th century, however, that the ascetic Siddhendra Yogi appeared on the scene and gave Kuchipudi a new definition and direction by training male Brahmin boys with great dedication. The then ruling sultan of Hyderabad, Abdul hasan tanisha, Nawab of golconda happened to watch the performance of the Brahmin boys and was very much pleased by the performance and gave away the village of Kuchipudi as a gift to the Brahmins Families of the village.. since then successive generations of the originally privileged Brahmin families of kuchipudi have pursued the practice of the art form with all devotion and thereby kept the tradition alive to this day. Originally, Kuchipudi was a male only dance tradition. Groups of men traveled from village to village enacting stories from the Hindu mythology. As in the Elizabethan theatre the roles of women were portrayed by men. It is only in the last century that women have been introduced to this art form. Kuchipudi in its present form is the result of the vision of stalwarts like Padmabhushan Vempati Chinna Sathyam and the late Vedantam Laksminarayana Shastry. Kuchipudi is a perfect blend of Nritta, Nritya and Natya and has all important aspects: pure dance and expressive dance. Nritta meaning pure dance, Nritya meaning expressional dance and Natya meaning dance drama. The Kuchipudi dancer is a multiple person on the stage and this multiplicity is achieved by the swift change of mime which depends more on the combination of the naturalism of the dramatic content and the symbolism of the poetic intensity of feeling of an episode. The consequence of this is the emphasis laid on the dynamics of movement and expressionism of feeling. Kuchipudi has now gained immense popularity because of its lilting music, graceful and flowing movements with vibrant stage presentation. Beautiful costumes, enchanting music and a vivacious dance technique make this style a delight to watch.